Alright kids, it’s time for some education and hopefully enlightenment. If I am in your store, shop, library, bank or wherever and I try to politely and gently educate you on how to act around a service dog let me tell you something important now. If someone is trying to educate you on etiquette that means you already crossed the line. So if you are being educated, the first words out of your mouth should not be “I used to (or currently) train service dogs.” Why? Because. if you did or do train service dogs, we wouldn’t be having this conversation at all. Please stop and think for a second before you speak that phrase in response. When the aforementioned words come out of your mouth when someone is trying to help you with service dog etiquette it makes you look like an idiot. Why? Because it then makes it look like you just don’t care about the rights of someone with a service dog and are being willfully dismissive of their rights because you feel you know better. I do not have a service dog myself but spend a good deal of time around people who are close to me that do. I also have disabilities myself that may lead me to one day needing a service dog so this is a topic close to my heart. Now, let’s try to get some tiny bit of perspective on what it’s like to be a regular person who happens to have a disability or disabilities living their day to day life. I want you to try and put yourself in the place of the person with the service dog. You are out just trying to run errands, maybe you have family or friends with you or perhaps not and you just want to get things done after a hectic work or school week (or maybe both). Perhaps you are trying to enjoy a meal or little time to yourself even while you are out and about. You with me so far? Ok. So here you are out doing all your things and every 5 minutes someone stops you to talk about your service dog. You get endless questions and commentary. What breed it is? How well behaved it is and that your dog would never be that well behaved. What’s it’s name? How long have you had it? Can they or their child pet it? Why do you have a service dog? You don’t look sick or blind! They ask why you really need a service dog, and want you to get specific with them. They keep asking for details of your personal medical history. They want to tell you all about their dog that is a pet. They want to tell you that they trained dogs at one point. So, your ability to efficiently simply run quick errands or enjoy a movie, meal, etc. has been drastically reduced because people are constantly stopping and interrupting you. This adds a level of strain and frustration to your every day life: every single day that you interact outside your home. Think about that; every single day. To add insult to injury, so to speak, female bodied handlers often tend to receive more flak, verbal abuse, and resistance to accessing their civil rights than male bodied handlers do. This isn’t to say that male bodied handlers don’t get all of that because they absolutely do. Female bodied handlers just tend to get a lot more of it. Think about that real hard folks. This is just the tip of the Titanic sized iceberg. Guess what? We haven’t even gotten to the part where you go to stores, restaurants, etc. and are told “We don’t allow dogs here.” Yes, you will hear that particular phrase more than you ever thought possible. So let’s get down to some of that education I promised you. We’ll start with bare bones basics of service dog etiquette. Please ignore the service dog entirely. You are not being rude if you don’t acknowledge the Service Dog’s presence. Most handlers will actually be thrilled if you ignore their medical equipment completely. Service dogs are not pets they are classed as medical equipment. Though let’s be clear, their owners love them dearly and do play with them often when the dogs are not working. Do Not Distract the Service Dog in any way: you’re endangering the handler when you do. 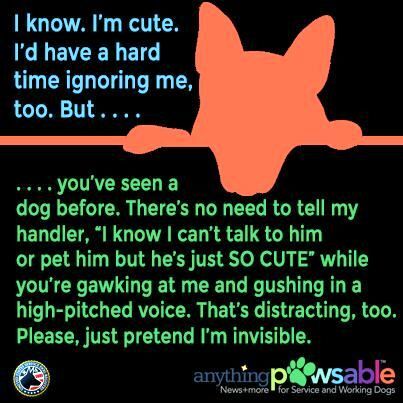 This includes but isn’t limited to: making noises/bark at them, offer the dog food, water, toys, etc. Do not allow your children to do these things either. Here’s your chance as a parent to teach them proper etiquette early. Do Not Pet the Service Dog: you are endangering the handler when you do. If you are trying to pet the dog when the handler isn’t looking, you already know you shouldn’t be doing it. Do not encourage your children to pet the service dog either, no matter how much they want to. Your job as a parent is to teach your child, not the handler’s job to allow your child access to their medical equipment. Never ask personal questions about the handler’s disability or intrude on their privacy. Service dog handlers do not walk up to you in the store and start asking about your medical history/conditions or those of your children. Just don’t do it, it’s RUDE! Do not assume because you can’t see the handler’s disability they they are not disabled or are training the dog for someone else. 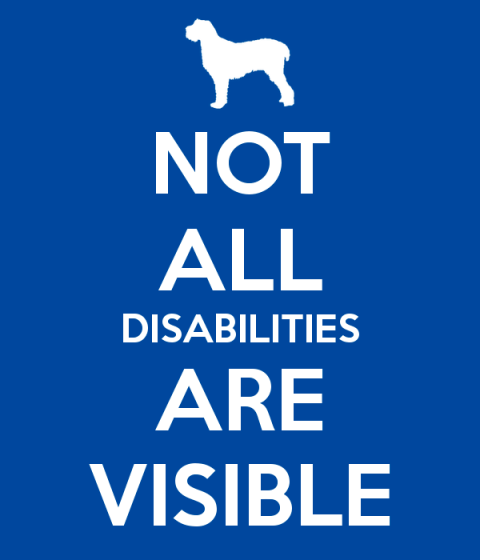 All disabilities are not visible. Businesses are limited by Federal law as to what they can ask. Businesses may only ask if an animal is a service animal or ask what tasks the animal has been trained to perform. The handler cannot be asked what condition requires them to have the service dog. 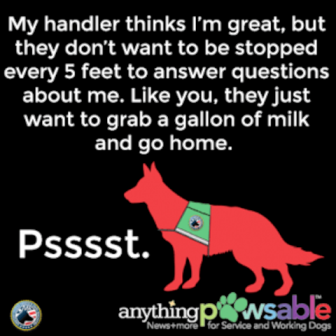 The handler’s answers may be as simple as: “It is a medic alert dog trained to perform tasks alerting me and helping with physical tasks.” They are not required to go into more detail. Businesses cannot require special ID cards for the animal or ask about the person’s disability. For more information, please download the U.S. Department of Justice ADA (Americans with Disabilities Act) Business Brief: Service Animals as a PDF. They don’t have proper documentation. It is illegal under Federal law for anyone to require documentation of a team. Also under Federal Law, vests or other identifying gear is not required. People may be allergic to dogs. There is a very easy solution to this: do not touch the dog, very simple. Also, these dogs are groomed highly and regularly because they are out in the public. If you keep your hands to yourself you are at no more risk being around a service dog than you are of being around someone who doesn’t brush the fur and dander off of themselves before they leave home where they live with their pets. People may be scared of dogs. It’s a hospital. They are of course not allowed in sterile environments (i.e. an operating room), but they are allowed in hospitals. The dog might be scared of whatever is going on at the venue such as, loud music, drumming, dancing, etc. These dogs go through copious and constant training in a multitude of environments long before they are paired with their handler. 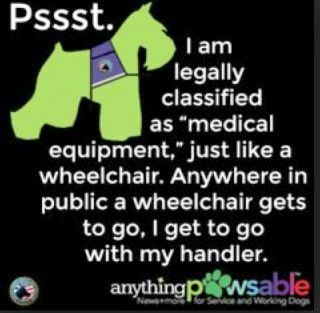 This is to accustom them to so many things the average lay person couldn’t even imagine to condition them to be service dog. They also continue their training with their handler once they are paired and in service. Training never stops for them as long as they are a service dog. The dog might get stepped on. It is the handler’s responsibility to manage the dog’s safety. Needless to say, I could go on, there are a zillion more not viable reasons. 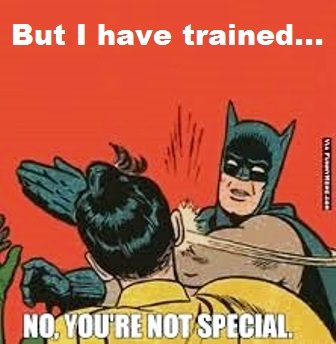 However, this should give you an idea of some of the ones that most handlers experience being told on a regular basis. This should be a good primer to get you through just about any interaction with a service dog team and come out doggone good! There will be more info on service dogs and their handlers to come. Don’t worry I will help you educate yourself and hopefully you will help educate others. Each one teach one! Next up: the differences in types of dogs such as Service, Therapy, Emotional Support and Working. Along with where each type of dog is legally allowed to go. ← Where in the World Was Mags? Thanks for this. I attend a meeting where a gentleman has a service dog. Because our lease bans dogs, we have asked him to make sure it wears it’s vest, not so he can bring it, just so that other people don’t see him and assume they too can bring a dog. Were we being offensive? Or illegal? You’re most welcome Rebekah! This is a very under served population that needs more education out there. The lease does not apply to Service Dogs if it is a public venue. If it is a public venue then the service dog is allowed entry because the handler is allowed entry. So denying the service team entry would be illegal under Federal Law. Under Federal law no vest is required. Only he can answer if you were being offensive. I know some handlers would find it offensive. Generally service dogs are vested when working though it’s not required.